Each small bulb has been positioned to bring the sloth character to life with light! The Sloth light is battery powered and will require 3 X AAA batteries. The sloth night light also works well as a table lamp and is a great decorative addition to any room. IKEA SMILA BLOMMA Pink Flower Childs Childrens Kids Wall lamp light. 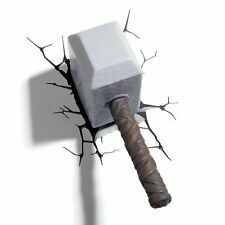 Used, fully functional. 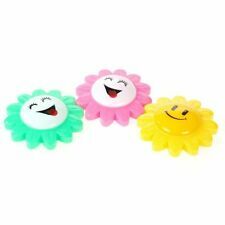 IKEA SMILA BLOMMA Pink Flower Childs Childrens Kids Wall lamp light. Condition is Used. Bulb will not be sent. Dispatched with Royal Mail 2nd Class. 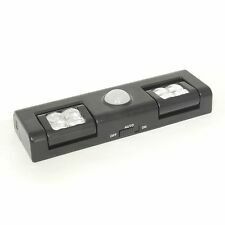 Lloytron LED Light with PIR Motion Sensor - D2250BK. Camping, Inside Cabins on Cruises, Cupboards, Garages, Wardrobes, Sheds etc. 8 x Super Bright LED Beams. ON/OFF/AUTO Switch. Light Illuminates For Approx 10 Seconds When On Auto. Lovely IKEA Moon wall lamp for a kids room. 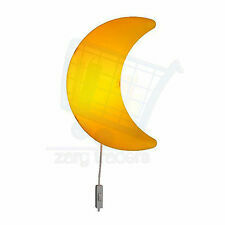 Lovely IKEA Moon wall lamp for a kids room.. Condition is Used. Collection in person only. Each Light Requires DC Input 4.5V = 3x 1.5V AAA Alkaline Batteries (not included) // Remote Requires DC Input 3V = 2x 1.5V AAA Alkaline Batteries (not included). But giving us a chance might change your perception and experience. · Wall lamp SMILA HJÄRTA. Always secure the cord to the wall with the included cord fasteners. · Can also be used as a bedside table. · Gives a soft mood light. · Height: 30 cm. This product bears the CE mark. There are two light settings that are easily operated by the on / off switch. Designed with safety in mind, the light is cordless, battery operated and stays cool to touch. Great Range on Kids Bedding, Duvet Sets, Toddler Beds, Curtains, Toys, Wallpaper, Borders and many more Childrens bedroom accessories. The wall light has an easy to use on/off switch. Designed with safety in mind, the light is cordless, battery operated and stays cool to touch. 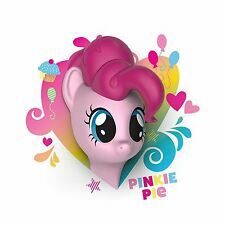 My Little Pony 3D Wall Light - Pinkie Pie. Kids Bedroom. IKEA SMILA BLOMMA Wall Lamp Flower Light Pink, Inc Bulb And Free Postage ! IKEA SMILA BLOMMA Wall Lamp Flower Light Pink. Condition is Used. Comes with ikea led bulb. Dispatched with Royal Mail 2nd Class. FREE POSTAGE ! This striking LED Neon Effect Cloud Light in Blue will be a fun and colourful addition to a child's room. The mains powered wall light emits a blue glow when lit and is white when unlit. Presented in a gift box, this lovely light will make a great present. IKEA SMILLA BAGGE 2014 CHILDREN'S GREEN BUG WALL NIGHT LIGHT. Taken out of packaging but never used as decided on a different theme for our play room. I’ve tried the light with the bulb and it work perfectly. Comes with correct ikea bulb. Only thing I no longer have are the wall fixings but just basics plug & screw fixings are required. Dispatched with Royal Mail 2nd Class. The wall light has an easy to use on/off switch. Designed with safety in mind, the light is cordless, battery operated and stays cool to touch. Cool 3D effect wall light. Wall sticker included. Uses energy efficient LED bulbs which will never require changing. The wall light has an easy to use on/off switch. Designed with safety in mind, the light is cordless, battery operated and stays cool to touch. My Little Pony 3D Wall Light - Twilight Sparkle. Main colour: Lilac. 1 IKEA Smila Blomma Pink Flower Wall Lamp Kid Children Baby Nursery Night Light, with bulb Assembled size Depth: 7.5 cm Diameter: 34 cm Cord length: 2.2 m (in-line switch) Condition is used but good. I have 2 of these available. If you would like both, please bid on both and then message me before payment so I can combine postage for you, thanks. Dispatched with Royal Mail 2nd Class. Designed with safety in mind, the light is cordless, battery operated and stays cool to touch. Uses energy efficient LED bulbs which will never require changing, Easy to use on/off switch. Includes all components for an easy installation. Put your name in lights - and your messages too - with this A6 Cinematic Lightbox. 90 characters, letters and symbols are included so you can give all your messages a retro look. Flick the switch and watch your slogans glow in a soft yellow/white light. A magnetic backing enables you to effortlessly attach this to the fridge or other magnetic surface. Powered by battery or USB. The mains powered wall light emits a pink glow when lit and is white when unlit. Presented in a gift box, this lovely light will make a great present. This striking LED Neon Effect Heart Light in Pink will be a fun and colourful addition to a child's room. For wall mounting, can also be used as a desk / table lamp. ideal reading lamp, adjustable arm. gives directional light with a no-glare. 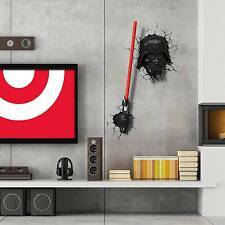 Star Wars Mini 3D Wall Light. This cool wall light is cordless and battery operated which makes it safe for children's bedrooms. An ideal gift for Star Wars fans. Easy to use on/off switch. Includes all components for an easy installation. 3D Light FX Star Wars Stormtrooper 3D Deco Light. Star Wars Stormtrooper™ 3D Deco Light from 3D Light FX. A great addition to a child's room, would also make a fantastic novelty gift for adult Star Wars fans. Gives a soft mood light. All cords can present a strangulation hazard. Never place a corded product within reach of a child in a cot, crib or playpen. Depth: 8 cm. Always secure the cord to the wall with the included cord fasteners. IKEA Children's Wall Light - Moving LED - RARE! IKEA - RARE DESIGN. Moving LED lights. Designed with safety in mind, the light is cordless, battery operated and stays cool to touch. Uses energy efficient LED bulbs which will never require changing. Easy to use on/off switch, Includes all components for an easy installation. This Star Wars Vader 3D Wall Light acts not only as a comforting night light but as an incredible feature in any child's bedroom. Designed with safety in mind, the light is cordless and stays cool to touch. Star Wars FX50002 Wall Light. The cracked sticker behind this 3D deco lamp makes it look like Yoda has crashed through the wall. The night lamp is super cool for children and adults alike. Wipe clean only. 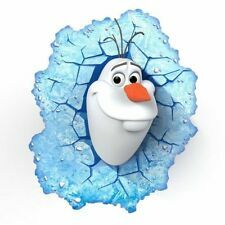 SAFE - The Frozen olaf is cordless power eliminates, battery operated which provides a comforting light for infants and children to fall asleep. Energy efficient - uses LED lights. COOL - Never gets hot, uses LED lights so always stay cool to the touch. Gives a soft mood light. All cords can present a strangulation hazard. Never place a corded product within reach of a child in a cot, crib or playpen. Depth: 9 cm. Always secure the cord to the wall with the included cord fasteners. There are two light settings that are easily operated by the on / off switch. Designed with safety in mind, the light is cordless, battery operated and stays cool to touch. Cool 3D effect wall light. This Modern Single LED Kids Wall Light from the 'Novelty' range by Searchlight Lighting looks great and is ideal wherever a modern look is desired. The 0124PI has a Polypropylene / Mirror Glass finish. Wall lamp SMILA HJÄRTA. · Wall lamp SMILA HJÄRTA. Always secure the cord to the wall with the included cord fasteners. · Can also be used as a bedside table. · Gives a soft mood light. This product bears the CE mark. Wall lamp DRÖMHEM White. All cords can present a strangulation hazard. Never place a corded product within reach of a child in a cot, crib or playpen. Gives a soft mood light. Always secure the cord to the wall with the included cord fasteners.